Drinkability of water is determined based on its physical, chemical, and microbial properties. Undesirable changes in these parameters could threaten the health of consumers. The present study aimed to assess the physical, chemical, and microbial parameters of the drinking water sources in Sanandaj, Iran and compare them with the national standard values. This descriptive, cross-sectional study was conducted for 24 months. Samples were collected via simple random sampling from 116 stations in accordance with the principles of water sampling, including 51 stations of Sanandaj water distribution system, 15 reservoir stations, 25 stations for the outlet of the water treatment plant, and 25 stations for raw water. In total, 2,784 samples were obtained from the stations and transferred to the laboratory in standard conditions. Residual chlorine, pH parameters, turbidity, total coliforms, thermophilic coliforms, and heterotrophic plate count (HPC) were measured. Data analysis was performed in SPSS version 18 using t-test and ANOVA. According to the results, the mean values for the physical parameters of turbidity and pH in the water distribution system were 0.9522 NTU and 7.9644, respectively. With regard to the chemical parameters, the mean residual chlorine in the water distribution system was 0.5548 mg/L, and the microbial parameters of total coliforms, thermophilic coliforms, and HPC were 0 MPN/100 mL, 0 MPN/100 mL, and 107.6533 CFU/ml, respectively. Our findings indicated that the mean concentrations of the measured parameters in the water distribution system of Sanandaj were within the national standard limits. 2. Heidari M, Mesdaghinia A R, Miranzadeh M B, Yunesian M, Naddafi K, Mahvi AH. Survey on microbial quality of drinking water in rural areas of Kashan and the role of rural water and wastewater company in that improvement. Health System Research 2010; 6(Number Supplement): 898-907. 3. Mokhtari S A, Fazlzadeh Davil M, Dorraji B. Survey of Bacteriological Quality of the Drinking Water in Rural Areas of Ardabil City. J Health 2011; 2 (1) :66-73. 4. Balbus JM, Lang ME. Is the water safe for my baby? Pediatr Clin North Am. 2001; 48(5): 1129-1152. 5. World Health Organization. Diarrhea: why children are still dying and what can be done. New York: United Nations Children's Fund, 2009. 6. Montgomery MA, Elimelech M. Water and sanitation in developing countries: including health in the equation. Environ Sci Technol. 2007; 41(1): 17-24. 7. Alley ER. Water quality control handbook. New York; McGraw-Hill, 2007. 9. Dehghani M, Ghaderpoori M, Fazlzadeh M, Golmohamadi S. Survey of bacteriological quality of the drinking water in rural areas of Saqqez City. Iran J Health Environ. 2009; 2(2): 132-139. 10. Sadeghi G, Mohammadian M, Nourani M, Peyda M, Eslami A. Microbiological quality assessment of rural drinking water supplies in Iran. J Agri Social Sci. 2007; 3(1): 31-3. 11. Manshouri M, Momayyezi M, Khalili M, Jaoshani G. Determination of drinking water quality consuming in Yazd suburban buses in the first half of Year 2011 . J Ilam Univ Med Sci. 2014; 21:17-23. 13. Godini K, Sayehmiri K, Alyan G, Alavi S, Rostami R. Investigation of microbial and chemical quality of bottled waters distributed in Ilam (Wester Iran) 2009-10. J Ilam Univ Med Sci.2012;20(2):33-7. 15. Da Silva MEZ, Santana RG, Guilhermetti M, Camargo Filho I, Endo EH, Ueda-Nakamura T, et al. Comparison of the bacteriological quality of tap water and bottled mineral water. Int J Hyg Environ Health 2008;211(5):504-9. 19. Dindarloo K, Alipour V, Farshidfar G. Chemical quality of drinking water in Bandar Abbas . Hormozgan Med J 2006; 10 (1): 57-62. 21. Wazirie B AM, Amozegar N, Bazazyeh N. Iran Standard Number 1011. Institute of Standards and Industrial Research of Iran. 1364;2(4):1-100. 22. Environmental Protection Agency (EPA). National primary drinking water regulations: Long Term 1 Enhanced Surface Water Treatment Rule. Final rule. Fede Regist. 2002;67(9):1811. 23. Majdi H, Gheibi L, Soltani T. Evaluation of Physicochemical and Microbial Quality of Drinking Water of Villages in Takab Town in West Azerbaijan in 2013. J Rafsanjan Univ Med Sci 2015 14(8): 631-42. 24. Keramati H, Mahvi A, Abdulnezhad L. The survey of physical and chemical quality of Gonabad drinking water in spring and summer of 1386. Horizon Med Sci. 2007;13(3):25-32. 26. Karrabi MA, Hasanabadi M, Alinejhad a, khamirchi R, Tabaraee y. Evaluation of Physical, Chemical and Microbial Quality of Drinking Water in Davarzan Province Villages of Sabzevar in Authomn 2010. Beyhagh. 2011; 6(2): 18-28. 27. Ghaderpoori M, Dehghani MH, Fazlzadeh M, Zarei A. Survey of microbial quality of drinking water in rural areas of Saqqez, Iran. Am Eurasian J Agri Environ Sci. 2009;5(5):627-32. 28. 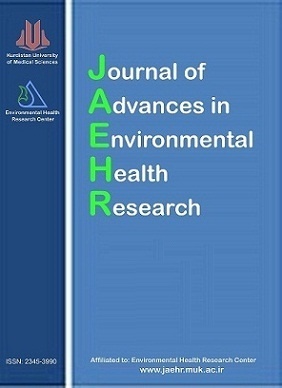 Jafarzadeh N, Ravanbakhsh M, Ahmadi Angali K, ZareJavid A, RanjbarVakilAbadi D, Ardeshirzadeh S. Evaluation of drinking water quality indices (case study: Bushehr province, Iran). Environ Health Eng Manag. 2017; 4(2): 73-79.